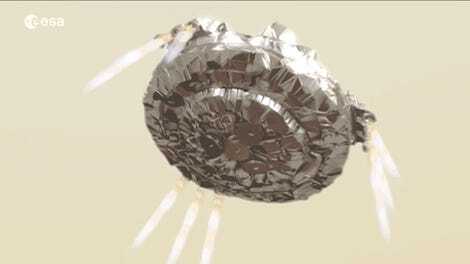 The European Space Agency’s Schiaparelli lander did not touch down on Mars as planned yesterday. During a press briefing this morning, ExoMars mission scientists confirmed that the lander’s signal cut out about 50 seconds before landing, and that something went wrong in the final steps, right around when the parachute was jettisoned. ESA is still analyzing data collected by satellites and telescopes to get the full story. ExoMars, an ESA and Roscosmos-led mission to search for signs of geologic and biological activity on the Red Planet, arrived at Mars yesterday after a seven-month journey. 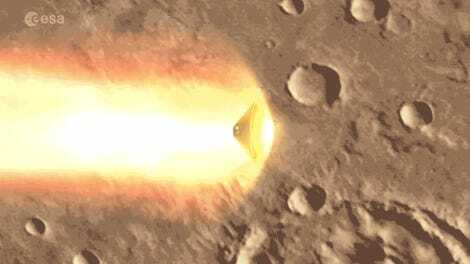 The mission’s scientific workhorse, the Trace Gas Orbiter, performed its orbital insertion maneuver beautifully, becoming the second ESA satellite to circle the Red Planet. The Schiaparelli Entry, Descent, and Landing Module (also called the EDM) did not fare so well. Its task yesterday was to arrive at the surface in one piece, by performing an automated landing sequence that included ballistic entry, heat shield release, parachute deployment, and finally, a 30 second firing of its retro-thrusters shortly before touchdown. Prior to entering the Martian atmosphere, the Giant Metrewave Radio Telescope (GMRT) in India began receiving a signal from Schiaparelli, but as ESA told us yesterday, that signal was lost “some time prior to landing.” A small fleet of Mars-orbiting satellites, including ESA’s Mars Express, NASA’s MAVEN probe and Mars Reconnaissance Orbiter, and the newly-arrived TGO, have been mobilized to search for the lander. 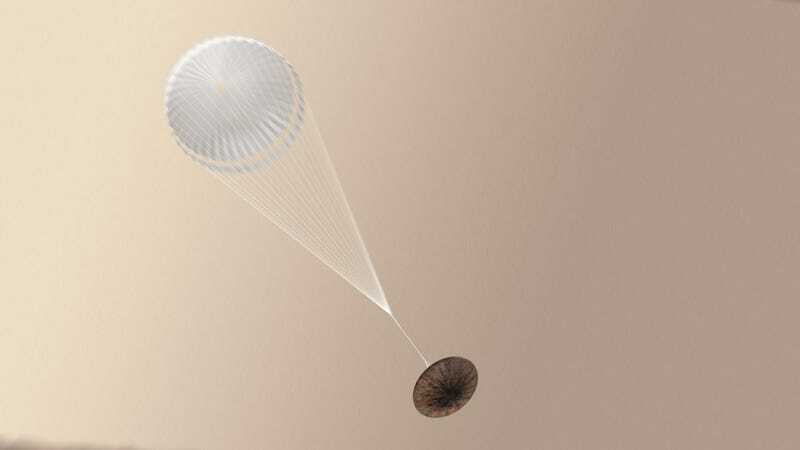 Telemetry data collected by TGO and downlinked this morning will be key to getting the full story on Schiaparelli, which seems to have successfully entered the Martian atmosphere, released its heat shield, deployed its parachute, and decelerated from 13,000 mph (21,000 kph) to 155 mph (250 kph). About a kilometer above the surface, when the parachute and back heat shield were set to release and retro-thrusters should have started firing, the lander ran into trouble. “This ejection itself appears to have occurred earlier than expected, but analysis is not yet complete,” ESA said in a statement. What’s more, it appears the thrusters fired for just a few seconds, instead of the intended 30. About 50 seconds before landing, Schiaparelli’s transmission went dead. As disappointing as it is to hear that the landing didn’t go off perfectly, it’s worth emphasizing that Schiaparelli was ESA’s dry run. The entire purpose of the lander was to demonstrate technology that will be used to bring a larger, mobile rover to the surface of Mars in 2020—and that demonstration included rooting out any design or operational flaws. Once ESA figures out exactly what went wrong, it’ll get to work making sure the same mistakes aren’t repeated. In the meanwhile, we now have another scientific orbiter around Mars.